There are 11 neighborhoods in the Town of Gilbert where residents have collectively saved 135 million gallons of water over five years. This achievement didn't happen by accident. About 25 years ago, these neighborhoods were organized into "Parkway Improvement Districts" or PKIDS. Instead of forming a homeowners association, the communities turned over to the Town the management and maintenance of their common landscaped areas, greenbelts, roadways and playgrounds. In return for the service, residents pay the Town extra property taxes. The neighborhoods range in size from 60 or 70 homes on large lots to 450 smaller homes. The Gilbert Parks and Recreation Department is responsible for the care of these neighborhoods. The department contracts with landscape maintenance companies who kill weeds, mow grass, trim trees and shrubs, and keep the playgrounds tidy. The department does not contract out one important maintenance responsibility: the irrigation systems within these neighborhoods. Instead, Gilbert Parks department uses two employees trained as certified irrigation specialists to care for the systems. And that brings us back to the remarkable part of this story. The neighborhoods within the Parkway Improvement Districts have a total of 40 acres of grass, 20 acres of desert landscaping and 55 stand-alone irrigation controllers. The Gilbert Parks employees in charge of the neighborhoods not only wanted to make sure the irrigation systems were well maintained, they also wanted to make sure they were not over watering in some places and under watering in others. In late 2009, Parks employees asked Gilbert’s Water Department for help. The Water Department’s conservation and irrigation expert went to work on a water budget for each of the 11 neighborhoods. The water conservation specialist measured the acres of turf and the acres of desert landscaping within each community and determined the species of existing plants and trees. Using this information, the specialist calculated the volume of water needed to keep the landscape healthy and attractive in all seasons. Parks employees then set all 55 irrigation controllers each month to match the calculated water requirements created for each neighborhood. Water and Parks employees began meeting every month to review water-use reports and determine if they needed to make adjustments in particular patches of turf or particular desert gardens. 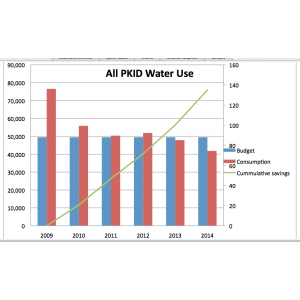 Monthly reports also can pinpoint a spike in water use down to an individual irrigation controller. That allows Parks employees to immediately investigate, find and repair the leak. In 2009, Parks used 54 percent more water than recommended by the water budget. By 2010, Parks used only 13 percent more water than recommended by the water budget. That year, Parks saved the town 20.6 million gallons when compared to 2009. By 2014, Parks used 15 percent less water than recommended by the water budget. In the last five year, Parks has saved 134.9 million gallons of the town’s drinking water. That’s enough water to serve 1,242 average Arizona households for a year. If water use is within 10 percent of a water budget, the landscape water management is considered exceptional. Residents of Parkway Improvement Districts meet with city officials once a year to talk about scheduled renovations. Most renovation projects upgrade irrigation systems and add desert landscaping along the properties’ edges, where turf doesn’t work well for play areas and water from sprinklers can damage walls. When a renovation project is scheduled for a community, it means residents’ property taxes will temporarily increase to pay for the improvements. This Town of Gilbert project has garnered national recognition, but it isn’t just innovative and vigilant town employees who deserve credit. Residents deserve a thank you, too. They paid for the savings.